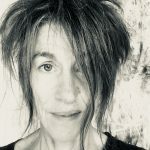 Chantal Bilodeau is a playwright, translator, and research artist whose work focuses on the intersection of science, policy, culture, and climate change. She is the Artistic Director of The Arctic Cycle – an organization created to support the writing, development and production of eight plays that look at the social and environmental changes taking place in the eight countries of the Arctic – and the founder of the blog and international network Artists & Climate Change. Certain species of fish spawn in different locations. Pods of gray whales no longer overwinter at the equator. Yellow cedars are moving north. 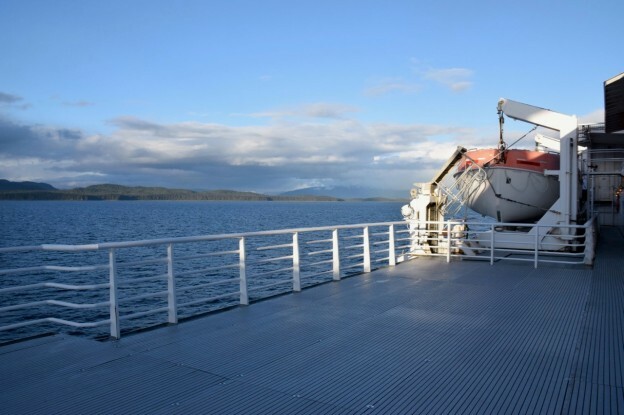 Those observations were related to us, a group of artists engaged with climate change, while we were traveling through Southeast Alaska as part of the Tidelines Ferry Tour in April 2016. It didn’t matter whether we were in Kake, Ketchikan, or Kodiak. The specifics differed, but the story was the same: Patterns of migration are changing. 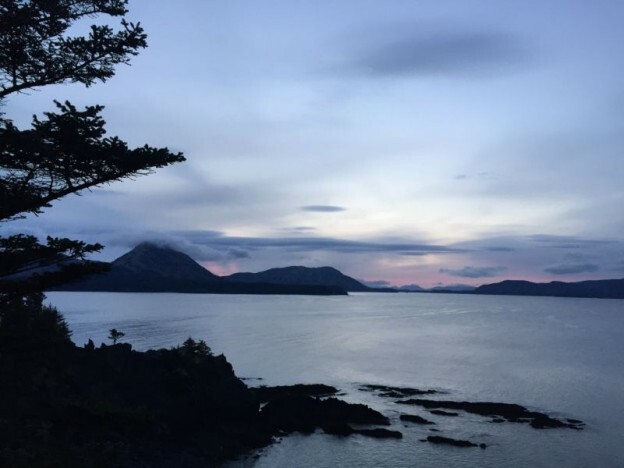 The purpose of the tour, organized by the Island Institute in Sitka, was twofold: 1) to share our work with the communities we visited, and 2) to host public conversations where people were invited to talk about the changes they are witnessing in their respective environments. Throughout the month, we visited nine communities ranging in population from 600 to 300,000, hopping on and off the ferry, often in the middle of the night, and relying on strangers to open their homes to us. When we were lucky, we were invited into tribal houses and treated to stories about life in Alaska. I was there to do research for a play about migration. This play is the third in a series of eight plays titled “The Arctic Cycle” that look at the social and environmental changes taking place in the eight Arctic states. The first two plays, set in Canada and Norway, deal with oil, sovereignty, cultural identity, responsibility, and legacy. I had been searching for a different angle with which to approach the play set in Alaska, the United States’ Arctic territory. When I came across an article about Syrian refugees crossing the border between Russia and Norway on bicycles, I decided to look at migration. Migration is universal. Whether human or animal, voluntary or forced, fluid or disrupted, it is one of the most important survival skills we possess. We migrate for food, security, and better climate. We migrate to escape predators, birth our young, and seek opportunity. We migrate because the route is mapped in our genes, and because we yearn for change. At the top of the world, where everything is magnified, migration is a spectacular annual event. Whether it is porcupine caribou on the coastal plains, snow geese in the Matanuska Valley, or salmon in the Chilkat and Copper rivers, the astonishing number of individuals who gather in one spot year after year boggles the mind. And perhaps less visible but just as significant in shaping the Alaskan landscape are the waves of human migration that have washed over the state in the last several thousand years: the first inhabitants who crossed the Bering Land Bridge, Russian and British settlers, fortune seekers during the Gold Rush, and job seekers during the oil boom. Sadly, with the onslaught of climate change, migration has taken on negative connotations. Increased warming has changed the Arctic environment. Some migratory birds now arrive too late in the spring and miss the most nutritious vegetation growth, sometimes causing massive die-off. The northern movement of shrubs is impacting caribou, muskoxen, and other animals that depend on tundra habitat. And several human communities are facing relocation due to severe erosion that threatens their villages and infrastructure. For months, I have agonized over this information, wondering how to write about it. What does this mean for our world and for us? Where is the poetic lesson? Where are the hidden metaphors that could point to possible ways forward? 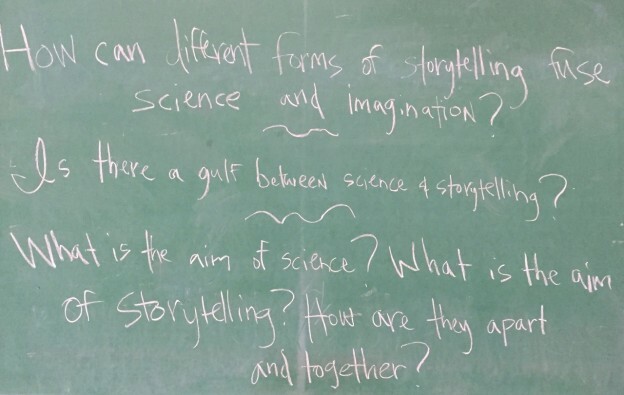 These questions were swirling in my head when, in September 2016, I participated in the first Citizen Artist Incubator hosted at the International Institute for Applied Systems Analysis (IIASA) in Austria. During the residency, I reached out to a number of scientists, including the economist Jesus Crespo Cuaresma in the World Population Program and Ulf Diekmann, program director of the Evolution and Ecology Program. I asked about climate change and migration. I asked about evolution and intelligent design. And I asked about human nature. Sometimes, changing the color of your lens makes a world of difference. I don’t mean to make light of the incredible hardship suffered by both humans and nonhumans who are forced to migrate under dire circumstances. But if we just put aside the cause for a moment and focus on the action itself, don’t we have plenty of reasons to rejoice? As an adaptation strategy, migration is an act of resistance. It’s the species learning to survive under new conditions. It’s life affirming its creative power. Yes, we need to address climate change—even more urgently now that we have an administration determined to ignore it. Yes, we need to understand the risks and prepare for what’s to come. Yes, this is a scary time. But—and perhaps this is where the poetic lesson lies—let’s not forget all the ways in which we manage to survive. Let’s celebrate the determination and courage of those who either migrate for the first time or modify their age-old migration route. They are our climate change heroes. I recently learned that beluga whales are delaying their migration south and staying in the Arctic longer because sea ice takes longer to freeze up each fall. Of course, we have no way to predict whether this will be a successful adaptation strategy, but while before, my first reaction would have been to fear for the beluga, today I say thank you. Thank you for adapting. Thank you for doing everything you can to survive. Thank you for giving me and the Earth the miracle of your continued existence. 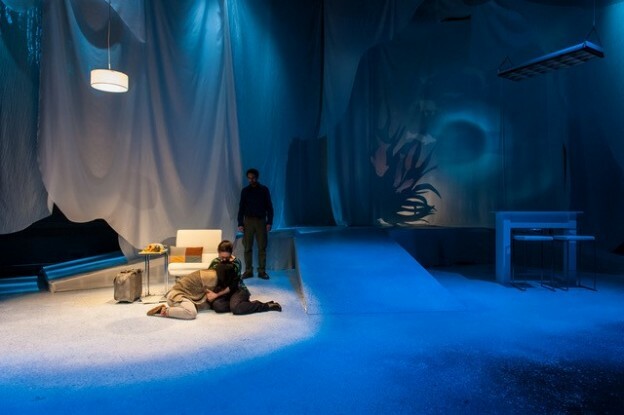 Sila, the first play of The Arctic Cycle, produced by Underground Railway Theater in 2014. Photo: A.R. Sinclair Photography. This article was originally published by Arctic in Context, a World Policy Institute initiative, on February 1, 2017. ← Ice Melting. Ice Writing.